I am very much at home when I am in motion. 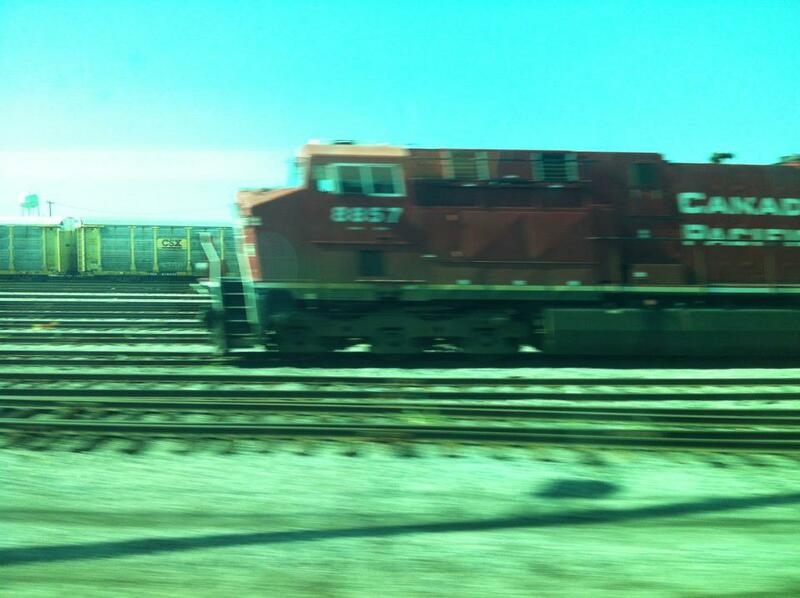 Here is a picture I took a few days ago on the commuter train from the Chicago suburbs into Downtown Chicago. On a train such as the one I was on when I took this picture , or when I am driving, or when I am taking a walk—-I have many productive thoughts. The place where we return each day after our work—or where we return after a vacation—has many virtues. Being in motion also has many virtues. When in motion we see new things and we are energized. The Earth is constant motion around the sun. Without neglecting the fact of the underlying brutality of this wicked society— everyday and every place has great value. 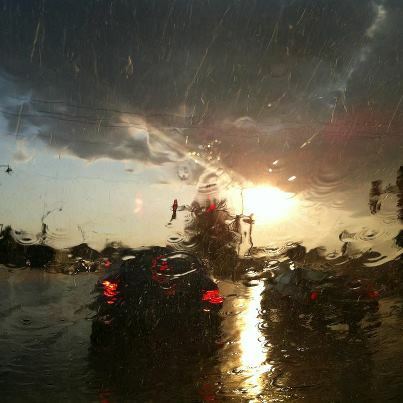 Here is a sun shower as seen through an impressionist windshield. This picture is from two days ago in the Chicago suburbs. It is time to fly home to Houston from Chicago. Here is a picture of some geese flying a few days ago in a Cook County forest preserve. 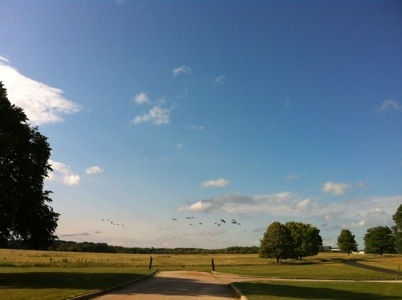 I don’t know if these geese were flying north or south. Maybe they are staying in place for the winter. It must be tough to know how best to migrate with the Earth heating up. In any case, my plane this afternoon is headed back to Texas. The Willis Tower is the black building. 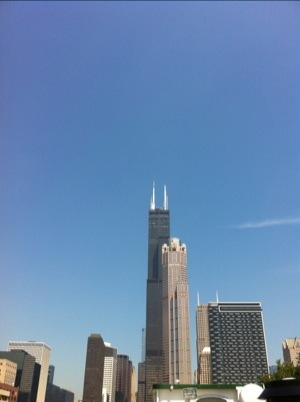 It is the tallest building in Chicago and one of the tallest buildings in the world. You can go up on top of it and look around. The Willis Tower is the former Sears Tower. The name was changed a few years ago. I think I heard at least four different folks say today that they’d never call the building anything other than the Sears Tower. I don’t care what anybody calls it other than to say the correct name of the building is the Willis Tower. And I thought we were all supposed to be willing to adapt to change to be able to succeed in our globalized economy. 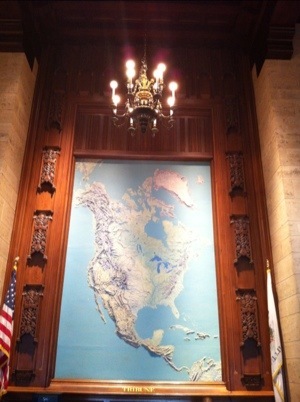 Here is a picture from the lobby of the Chicago Tribune building in Downtown Chicago. I took this picture this afternoon. I enjoyed this big map of our hemisphere. 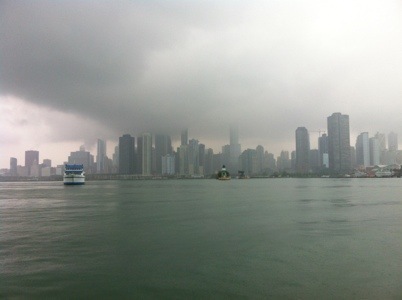 It was cloudy in Downtown Chicago today. It was a great day for a boat ride on Lake Michigan. 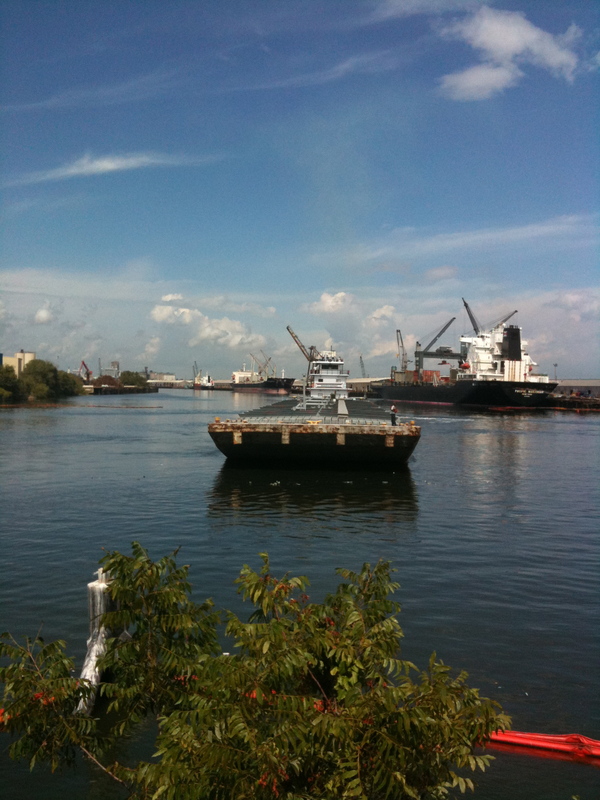 The boat I was on when I took this picture leaves a number of times each day from Navy Pier in Chicago. 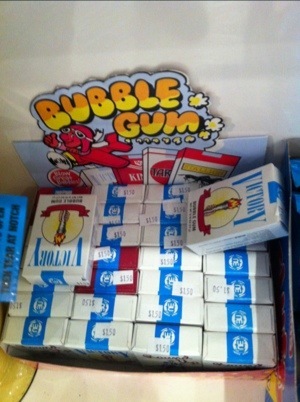 Here are some bubble gum cigarettes that I saw for sale today at the Navy Pier in Chicago. 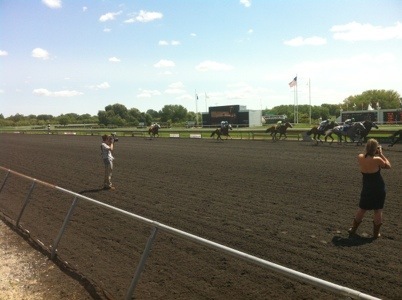 It was a great day for racing yesterday at Arlington International Race Course in suburban Chicago. Here are some horses approaching the finish line and two photographers present to record the event. The New York Times has recently written a series of articles detailing practices in horse racing industry-wide that endanger horses and jockeys. And yet I went to the track anyway. I’ve been going to horse tracks for many years and in many states. If you stayed away from everything that annoyed you, you’d never leave home. 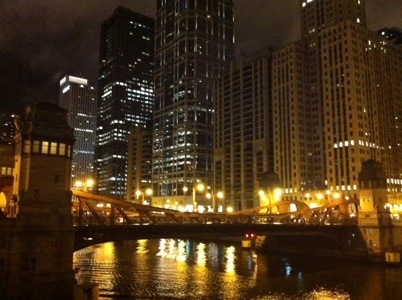 Here is the Chicago River at night in Downtown Chicago. I took this picture last night. Chicago is a great place to take a vacation. Here are some facts about the Chicago River. 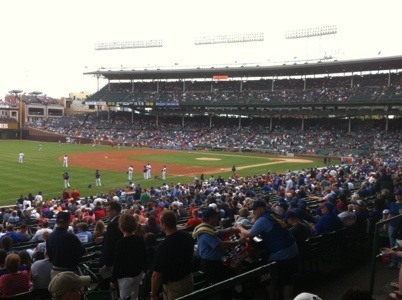 I’m at Wrigley Field this afternoon. I’m sorry that each of you can’t be with me here this afternoon for a blog day at the baseball game. Today is mini foam finger day at Wrigley Field. In addition the foam finger and the action on the field, I intend to purchase a frosty malt. 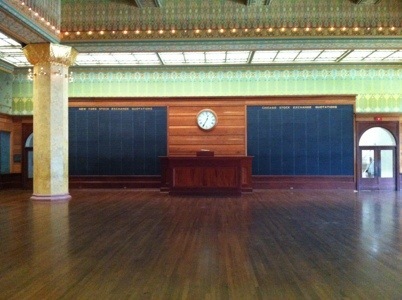 Here is the old Chicago Stock Exchange room that has been moved to the Art institute of Chicago. There were a few minutes I was in the room by myself. It was great to have the chance to look around without anybody bugging me. Some folks would walk in the room and not have a clear sense of what it was. They’d walk out a moment later without checking it out. Sometimes I get so tired of people that they annoy me no matter if they are around or if they are not around. 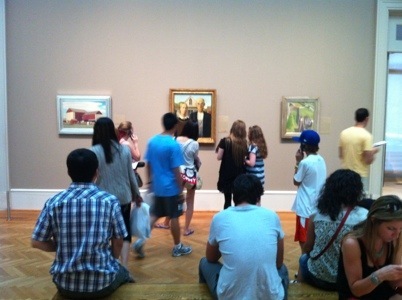 People come from all around to the Art Institute of Chicago to see the famous painting American Gothic. Here you see a crowd of such observers at the Art Institute this afternoon. American Gothic was painted by Grant Wood. What could be more All-American than seeing this famous painting in the great Midwestern capitol of Chicago, Illinois? Yesterday I flew from Houston to Chicago. With this post is a picture I took from the airplane. I’m not certain what state is shown in this picture. It might be Missouri, Kentucky or Illinois. Not knowing which state is pictured does not mean I view these places as so-called flyover country. All places are interesting and have value. I always get a window seat when I take an airplane trip so I can see what is going on down below. All people, all places and all moments have value. 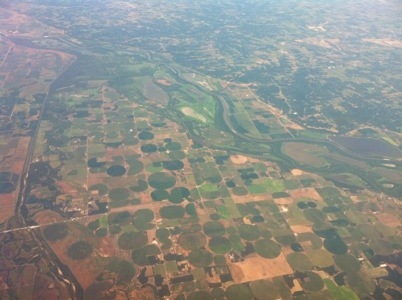 The picture here shows some irrigation. We should irrigate our lives with friendship, thought, action and flexibility. Metaphor and the physical world give each other form and purpose. Jet travel is an everyday modern marvel. We are able to fly over the place. 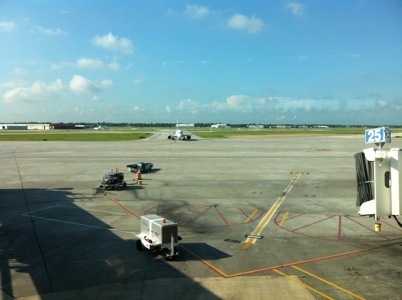 I’m at the airport in Houston right now looking at airplanes. Soon I’ll be up in the air on one of these planes. I’ll be posting from Chicago and the Chicago-area this week. Mobile communications are an everyday modern marvel as well. The G8 and NATO summits are to be held in Chicago next May. The corporate-owned Mayor of Chicago—Rahm Emanuel— is ramping up the police state for the events. Mayor Rahm Emanuel wants to raise fines for resisting police as the city gears up for anticipated protests that will come with the G8 and NATO summits to be held in Chicago next May. Protesters found guilty of resisting a police officer or aiding escape would have to pay a maximum fine ranging from $200 to $1,000. Currently, the range is $25 to $500. The proposal introduced at today’s City Council meeting also would allow Police SuperintendentGarry McCarthy to deputize officers with other agencies, including the FBI and Illinois State Police. The proposal also would appear to give the mayor greater power to sign contracts related to planning security and logistics without City Council approval. Here is a perfect event to be Occupied as a rebuke to both parties, the obscene amounts we spend on defense, and the whole power structure in this corrupt nation. I can’t imagine that many protest actions are not already in the works. Here is the Occupy Chicago website. You can also find Occupy Chicago on Facebook.